The wife of Bakersfield Fire Chief Greg Watts is reminding drivers not to place children in car seats unattended, particularly while vehicles are warming. In a Facebook posting, Zaylor Watts urges parents to be mindful of this practice after she and her husband lost their truck in a fire last month. In an Ozark County Times Facebook posting, Zaylor Watts said following the fire she usually let the couple's vehicle warm 15 to 20 minutes because it's a diesel. 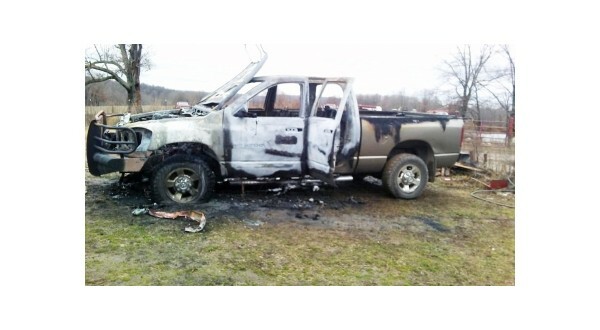 She said she walked out of the couple's home in late February to leave, heard a boom, and their truck was on fire. While no one was hurt, the vehicle was a total loss. Zaylor Watts says the incident could have been a lot worse for her family had anyone been in the truck. A fire investigator inspected the truck and determined the blaze was electrical in origin and started just outside the fuse box. The Bakersfield fire chief's vehicle loss came about a month after another Ozark County fire chief, Timber Knob VFD Chief Nancy Winslow, lost her home in a blaze believed to be from an electrical source. The home, off State Highway 5 South near the state line, was a total loss. However, no injuries were reported from the fire.